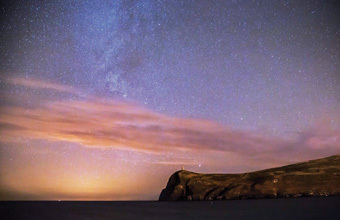 THE Isle of Man has become one of the country's best places to stargaze, with a total of 26 designated Dark Sky Discovery Sites - and plans to make them a key part of the island's tourism offering. Measuring just 32 miles long and 14 miles wide, the Isle of Man now has the largest concentration of Dark Skies sites in the British Isles, lying in some of the island's best beauty and heritage sites, such as Cregneash historical village, Rushen Abbey and Peel Castle. Head of tourism Angela Byrne said: "To have one site given Dark Sky Discovery status is an honour, but to have 26 in total is quite unbelievable. "Our little island is a world away from the bright lights of the mainland's big cities, and we hope that this accolade inspires people to visit us, and experience our incredible surroundings, which of course include the night sky. "We are currently working with partners around the island to develop dark sky events and activities for 2014 and beyond."